TFT PROTO 5" Capacitive carries the 800x480 RVT50AQTNWC00 TFT screen. The SSD1963 display controller drives the TFT display, with a 1215K byte buffer that supports up to 864x480 at 24bpp displays. 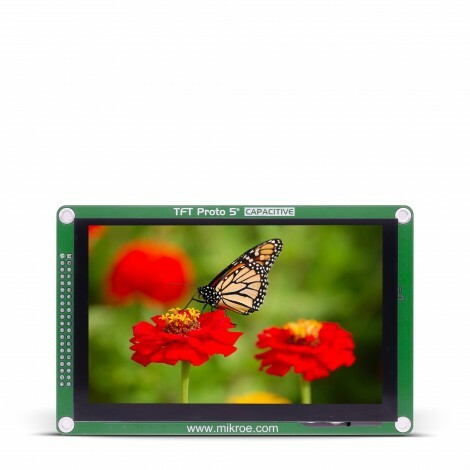 TFT PROTO 5" Capacitive carries the 800x480 RVT50AQTNWC00 TFT screen. 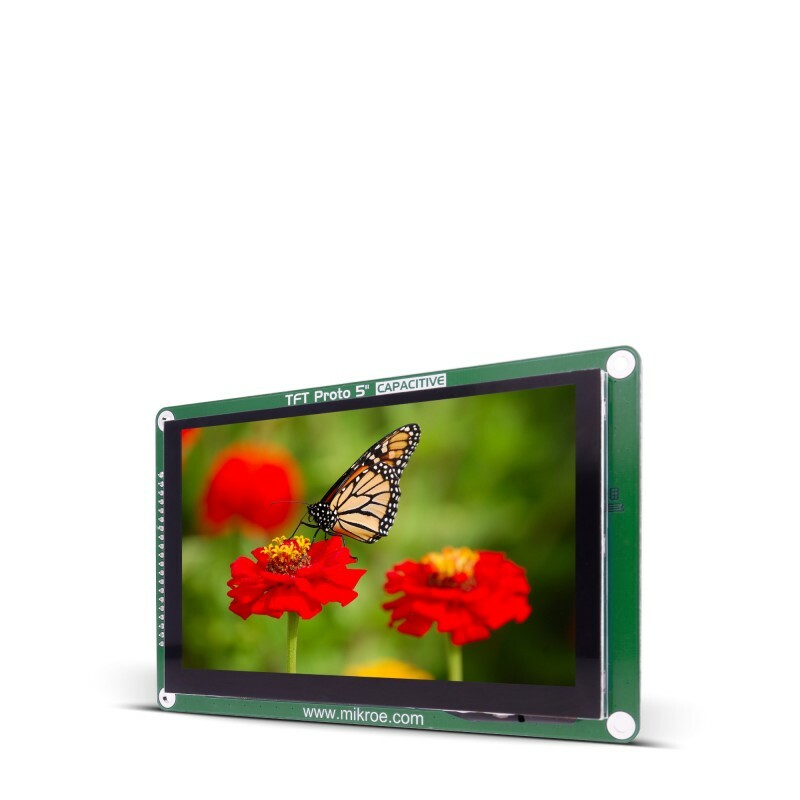 The SSD1963 display controller drives the TFT display, with a 1215K byte buffer that supports up to 864x480 at 24bpp displays. The touchpanel is driven by a FT5x06 single-chip capacitive touch panel controller. The board is lined with two rows of 20 pins for interfacing it with your MCU. 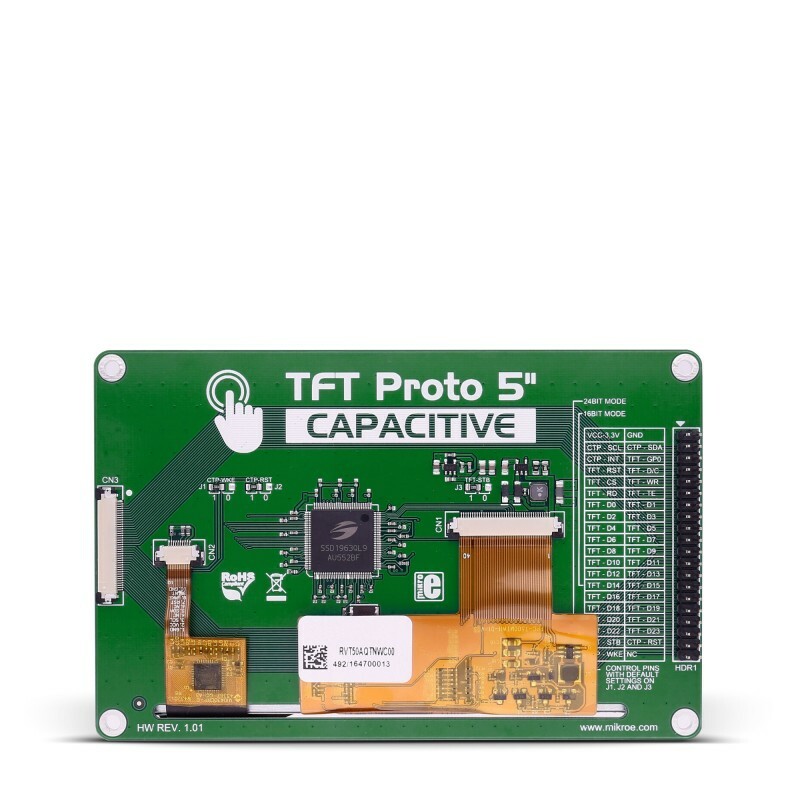 TFT PROTO 5" Capacitive uses a 3.3V power supply only. Capacitive touch screens work at the slightest touch. This type of a screen does not use the pressure of your finger to detect when the screen is touched. Capacitive screens use electrical properties of your body to detect this. Your finger causes a change in the electrical field of the touchscreen. Keep in mind that because of this, you cannot use if you are wearing gloves. Applications A cost-effective and practical solution for adding a TFT touchscreen interface to your design.